ps. she has the starring role, the sugar plum fairy! have a glittery rest of the week! Very lovely outfit and you are very beautiful! very cute, love the colors of your shoes! You must be so proud of your sister! The costumes will be so fun to see! Love those bright heels, and the way they match your lips! You're so cute! So glad you are feeling better! I love this outfit and the red shoes set it off perfectly! Loving the clogs :D what a nice touch the chain! Eek! I love this look! I love going to the ballet, I say the nutcracker when I was , it's a magical show. It's great that she got the lead. I love the shoes and those are a great pair of jeans. Glad that you're a lot better! You look lovely by the way!! i'm so happy i just came across it! those shoes are awesome! and i love those jeans! ADORBS!! I love how cozy chic you look!!! 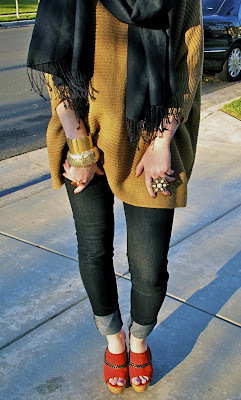 Love this post, the colors together are all so complimentary and those wedges are so hot. You look great, so perfect for fall. No lie, ur toe nail color is TOO CUTE!! Beautiful outfit!.. We adore it so much!.. The heels are awesome too! amazing outfit and i also love your hair color! Love the colors of this outfit! The heels are amazing! Hello! Love your knitted poncho! It looks so cosy and warm! And thanx for dropping by our blog and commenting! Hope u drop by again! Oh my gosh I love listening to MIchael Buble around Christmastime! It totally gets me in the Christmas spirit! I'm loving this look, especially the shoes! Redhead power! Yay! I love your red lipstick and shoes! 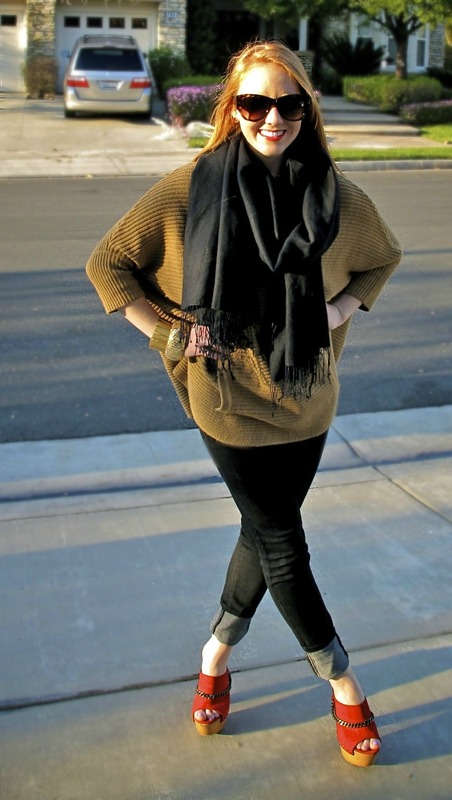 Also, that scarf and slouchy sweater are perfect together. <3 killer outfit. I love your poncho and shoes! Also congrats about your little sister I read your latest tweets and how excited you are! love frank sinatra! my uncle loved him so much he cried the day frank died! also, love your sweater!! I didn't see it in France ! how cool is that camel poncho? i love this! nice blog , if you want we can follow each other just let me know on my blog. Those shoes are gorgeous!!! And I usually don`t like that type of shoe. Well done!!! this sweater looks unbelievably cozy... i'm still totally in love with your red platform sandals. Hi kaitlin, found your blog via wardrobe experience - You are very very pretty and such style and the pics are wonderful ! Happy to have found you ! Your shoes are TDF - To.Die.For. You have some unbelievably gorgeous locks, lady! The red is AMAZING. love love love these shoes! Such a nice pop of color for this fall/winter ensemble! Loving this look! Chic but still cozy! those shoes...wow! i love the whole outfit, but the shoes are the perfect finishing touch! I have this cape too! It's so cozy & cute! 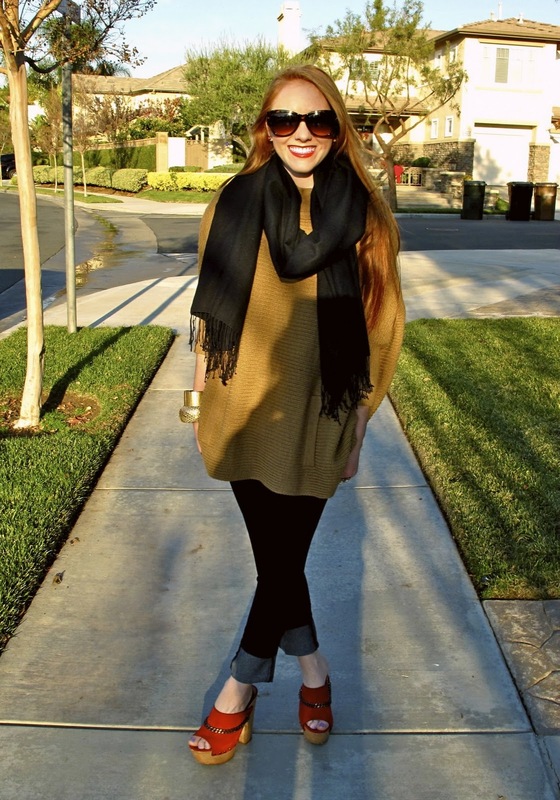 I love the way you styled it here! I want your poncho and your hair! !